Can we please just take a moment to stare at this gorgeous porridge bowl? Oh and that pear? It’s like a beautiful winter’s day in a bowl! 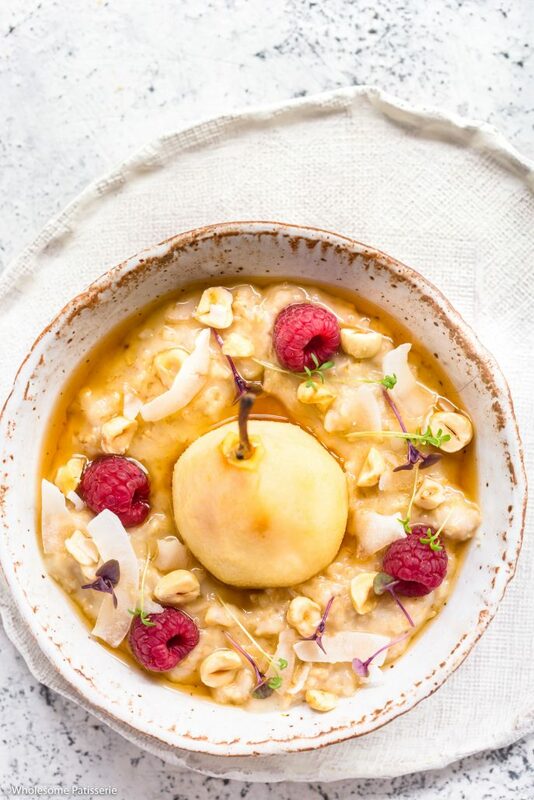 Poached Pear & Coconut Porridge, how heartwarming! 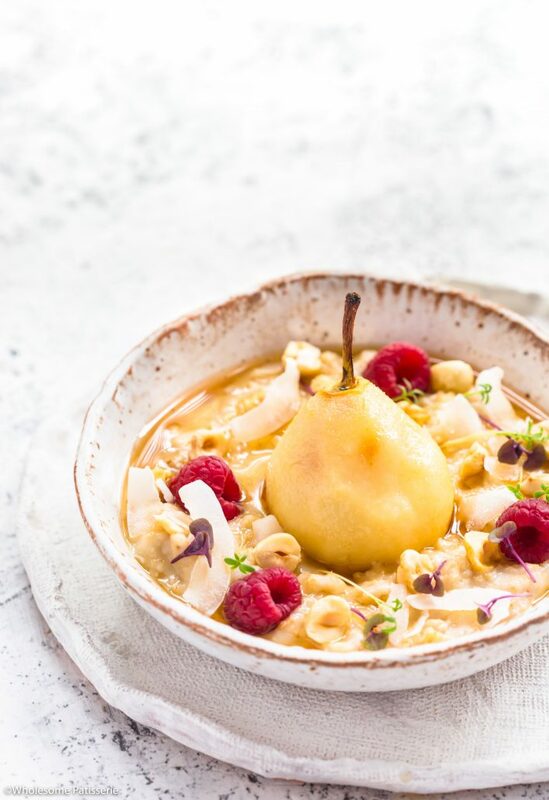 The pear is poached in coconut water – that’s it! I use Pure Cocobella Straight Up Coconut Water and it infuses a subtle coconut flavour into the pear, absolute perfection! The porridge is also cooked in the coconut water and a little coconut milk. If you don’t have coconut milk, you can also use any plant-based milk or regular if you’re not concerned about the dairy. The coconut flavour is not overpowering in this bowl, trust me. The flavour of the pear still shines on it’s own and paired with the warm creamy porridge, oh my goodness!!! You HAVE to make this for your breakfast! 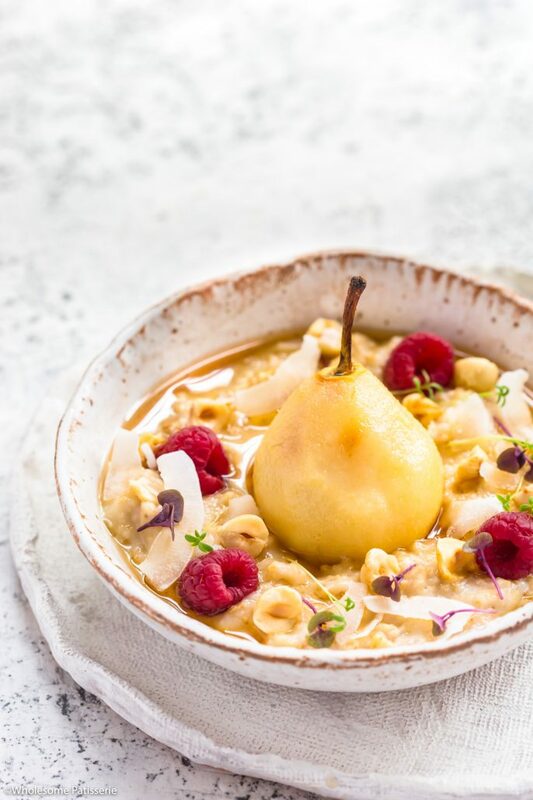 If it’s winter where you’re living, I wouldn’t doubt that this pear and coconut porridge will be on your weekly breakfast list! Top it all off with fresh raspberries, chopped hazelnuts, coconut flakes, micro greens (only because I had these beautiful micro greens/herbs growing in my garden) which is completely optional! They touch of green is stunning in this bowl though. 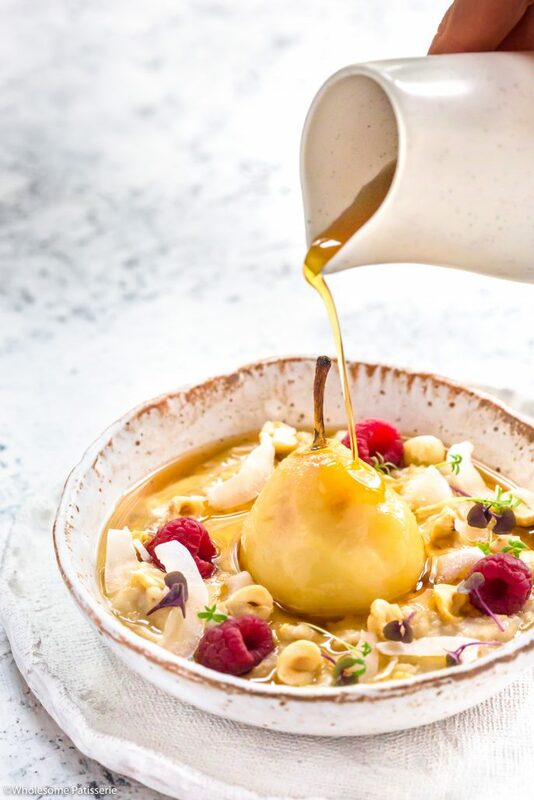 Oh and of course, maple syrup – you can’t not add maple syrup….. now go on and enjoy this incredibly delicious porridge bowl! Pour coconut water into a small-medium pot over high heat, bring to a boil. NOTE: judge to see if your pear will be covered enough in the water, if not, just pour a little more coconut water in. The pear doesn’t have to be completely submerged. Just before boiling point and a few bubbles begin to appear, reduce heat to a simmer and gently place the pear into the water. Poach pear, uncovered, for 15-20 minutes or until tender and soft, this will depend on how ripe your pear already was before poaching. Whilst pear is poaching, begin porridge. In another small-medium pot over high heat, add oats, coconut water and coconut water, mix well. Bring oats to a boil then reduce heat to medium on a fast simmer, cooking for 2 minutes, stirring occasionally. Pour in coconut milk and honey (or sweetener of choice), mix through and continue cooking for a further 3-4 minutes or until oats have broken down and are cooked. Remove from heat. Once pear is tender and soft, remove from poaching liquid and place in the middle of a serving bowl. Carefully spoon porridge around the pear. Sprinkle over toppings and desired amount of maple syrup. Keep leftover coconut water poaching liquid - cool down and use it in smoothies, juices or for poaching again.